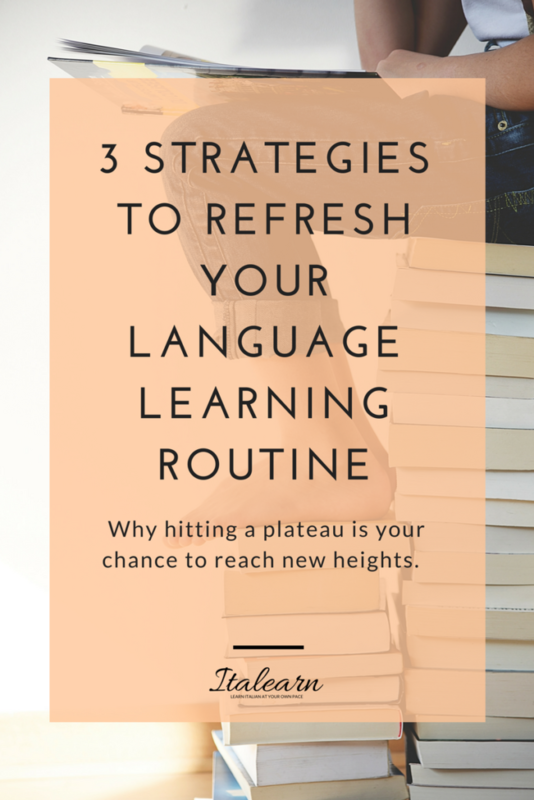 Language students of all times have confronted themselves with the plateau issue, there is *almost* no escape. When you start to learn a language everything seems so beautiful, you progress fast, you are able to track your many achievements, and you think that you finally got the hang of it. But then there is another moment, usually when you realize that you can have real conversations, even with native speakers, and you can make it on your own. This moment is either the end of it all or the start of a new exciting phase. The first article ever appeared on this blog was about motivation, the open secret of learning. And it really is. When you hit a plateau it means that you have lost your initial motivation, that driving force that made you do so much without even noticing. Technically speaking, the first phases of learning a new language are considered the easiest because you start from scratch and build on. Progress is clearly visible and measurable, you are excited to have gotten so far and, listen to this: you have every basic tool you need. For most people this is just enough. They are happy with what they have accomplished and usually stop studying. But what if you are a perfectionist? Or you need to speak the language for work, or you live in a foreign country and your children and husband speak that language but you don’t? This is when you need to really ask yourself what you want to do: remain in the “limbo” where it’s not bad, but not too good either; or do you want to get better and better everyday? I have no doubts here, you’d go for the second option. Because you care, because it is important for you. This is the moment when you will review your learning routine and figure out what is no longer working for you. Do you track the progress in a trackable way? What are your main learning inputs? Do you have enough occasions of practising the language with other real people (both learners and advanced/native speakers)? Think about these questions for a moment and then read how you can change your routine to break through the plateau. 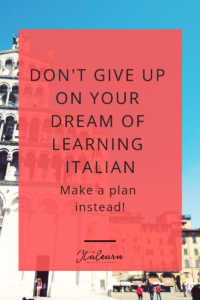 Learn enough vocabulary to be able to travel to Italy for one week. 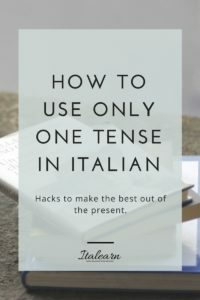 Learn at least 10 useful fixed expressions or phrases that I can use to accomplish everyday tasks in Italy (order at the restaurant, buy bus tickets, ask for directions, etc.). Master the 10 more important verbs in the present and past tenses. 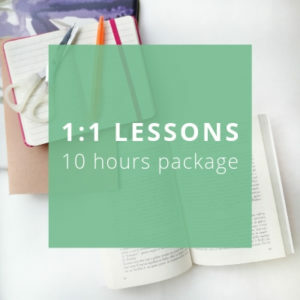 You set 3-months of self study + 1 hour live lesson with a teacher each week, and by the end of the second month you realize that all the goals are accomplished already. Create 5 categories from the vocabulary I already know and go deep, for example: food – 10 new vegetable names + typical dishes of the places I am going to visit + 5 specific verbs related to food and cooking. Learn how to pronounce correctly all the phrases I have discovered in phase-1. Try adding 5 more basic verbs + one more tense for all the verbs I have learned up to now. This is an example of how you can make your learning practice scalable and actually do (much) more than your initial resolutions. Once your new goals are set and your motivation is back and stronger than before, you need to work on the second part of your plan: tracking your progress. Now, many people don’t feel like they need to keep track scientifically of what they learn, but I think it can be very helpful, especially if you like to have everything under control. The habit of organizing our learning process introduces a pattern, a formula that our brain will remember and re-use automatically. If you already track your progress and notice that you have reached an impasse, you may want to consider changing your habits. If you don’t use any specific method to track your progress yet, this is a good moment to start. What to do: focus on developing your abilities and the way you track them. For example, if you usually concentrate on memorising by repeating words or verbs or phrases, try recording yourself using that word or phrase in three different contexts. Focus on the most common three meanings and elaborate on them. Create three sentences with each of the three meanings. Record yourself saying those sentences. This is going to help you gain clarity over the multiple uses of a single word, it teaches you the correct context where you can use that word, it makes your brain work on acquisition and pattern creation so it will become easier to learn new vocabulary. Have you ever tried flash cards? 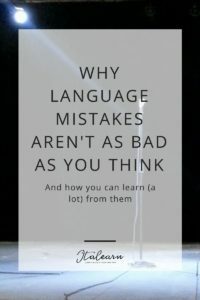 I generally don’t use them when I learn a new language, but many learners find them extremely useful. Image association? Think of or draw something that you associate with the word you want to learn and it will help you remember it in the long term. The Keyword Method is the scientific name of a mnemonic technique that includes two simple steps. First, associate the sound of the foreign word with a word (or more) in your native language – this similar sounding word is your keyword, and second, create a mental image that combines the two. Visualization is a powerful tool for memorization, keep it into account even if some of your visualizations are silly 🙂 . These are just a few examples, everyone has a learning style that best suits their needs, but if you are open to try other options, you may discover new methods that are a better fit for you. 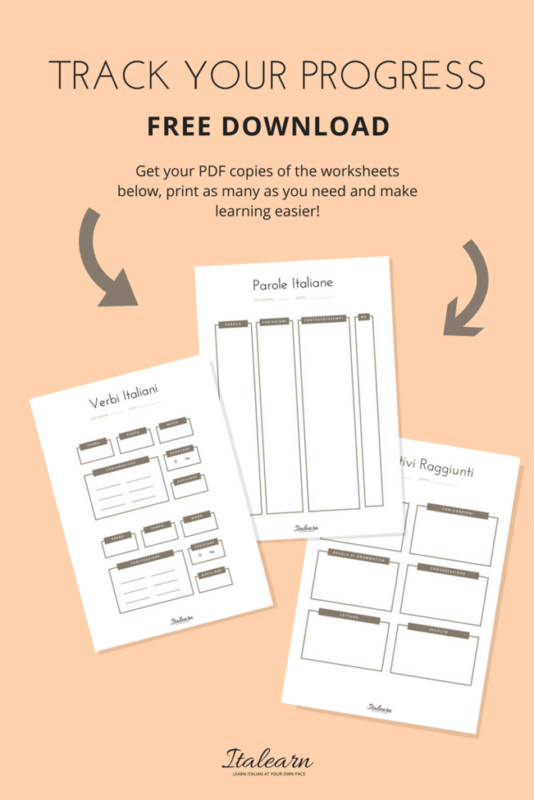 If you don’t usually measure your progress, you can download my free pdf worksheets for words and verbs study. They are very basic, perfect for beginners. 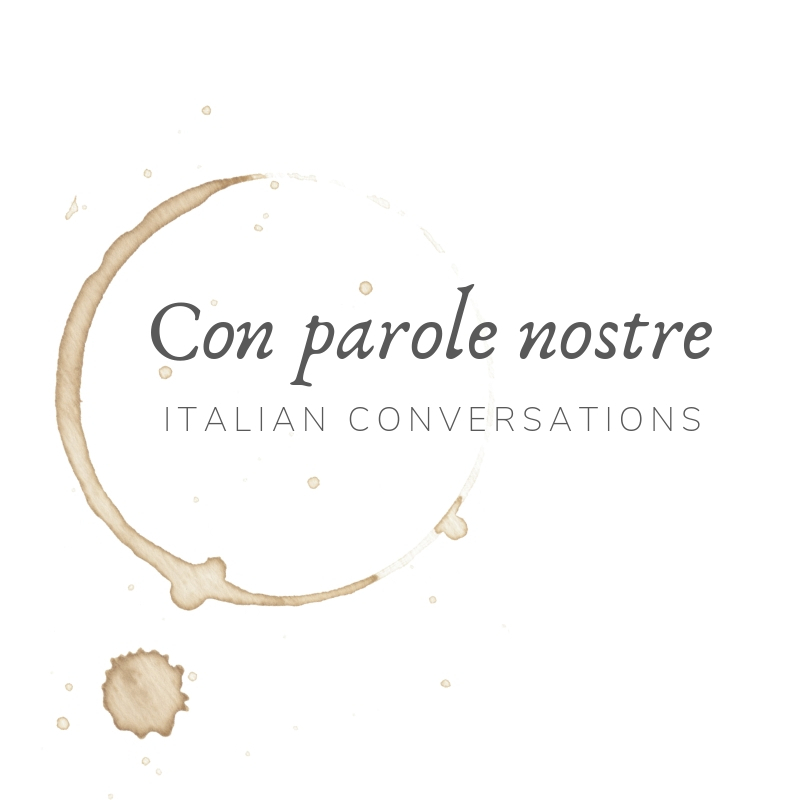 Parole italiane: this tool will help you to memorize new words and keep track of them. Just write the words you are learning in the first column, add variations you should remember (like a double gender, a different plural, or just anything that sounds “irregular”). Then, in the next column write down examples of uses in different contexts, if there is more than one meaning, or use this space for any note you believe is helpful. Add a sign in the last column when the new word is acquired (you may want to complete this step a few days, or even weeks after you first encounter the word, to make sure you really know everything about it). 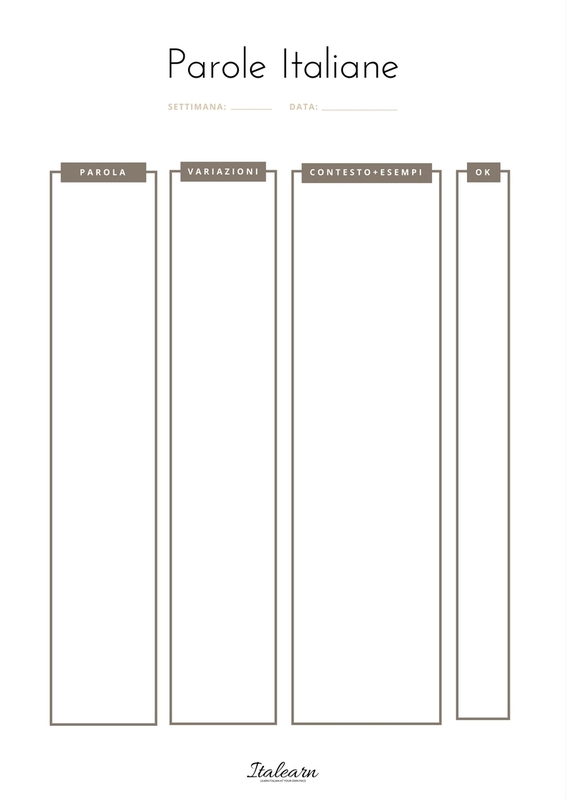 Verbi Italiani: this is a worksheet you can use when there are those verbs your brain refuses to learn who knows why. Write down everything about that verb: its infinitive form, the tense, the mood, whether it is regular or irregular, and which auxiliary it takes. Then put the conjugation in the central box and add the subject pronouns if they are helpful for you. 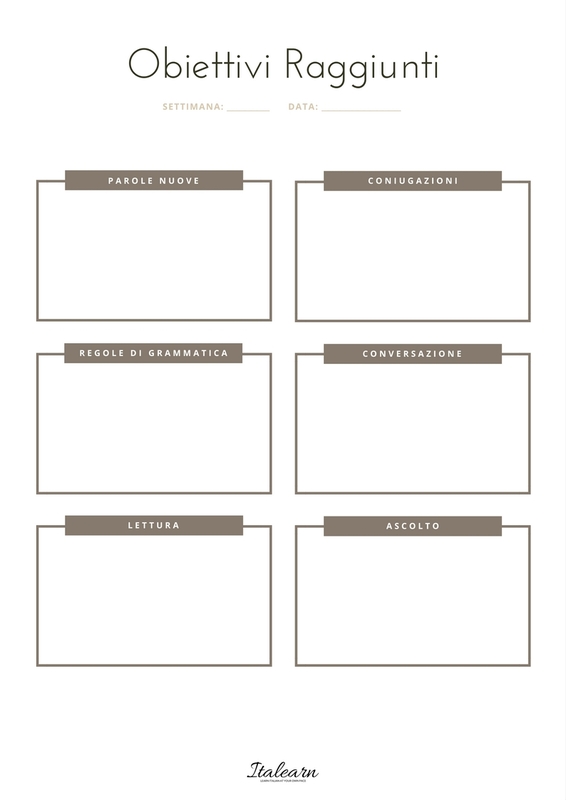 Obiettivi raggiunti: note all the goals you achieved in this worksheet, I have listed some major areas of progress you could take into account, but there is no right or wrong way of filling this in, just write what’s noteworthy for you. A learning input is anything in the target language that you can come in contact with. It can be a written text (blog post, book, newspaper, textbook, Facebook post, etc), it can be audio (podcast, song, radio, etc), it can be video (YouTube channel, television, Netflix, educational video, etc). When I first started learning English (I was 11), I realized immediately that something clicked, but I was in a class with 20+ other kids and they were far from being interested in school stuff – English lessons were playtime classes for those sitting in the back! So, I was feeling like I needed more than just my teacher’s awkward pronunciation and the few dialogues in the textbooks. That was more or less the same time when I discovered I liked music a lot and my little genius mind made the connection: English + music, that’s what I’m going to do, translate the lyrics! As it was an easy thing to do – which isn’t in general, and which was even more difficult at the time because we didn’t have the internet in the early 90s. So I had the brilliant idea to use my bilingual dictionary and the weekly lyrics and translations I found on the TV shows magazine. Of course I don’t recommend this method, I was just a kid and I had to make do with the few resources available to me. But: even if the “how” wasn’t perfect, to say the least, it served my purpose because I did learn a lot on my own and was able to reuse all my knowledge in the following school years. That experience also taught me that no matter the limited resources you have, you can still do a great job if you are focused enough and driven enough. Back to our strategies now. My question for you was “what are your learning inputs?”, as you can see from my example, there are plenty of opportunities to switch from an input that is no longer working for you, to something fresh and new. This magical thing that is called internet is really a lifesaver for all us language learners (and teachers!). My advice is to look for authentic sources from any industry that resonates with you. 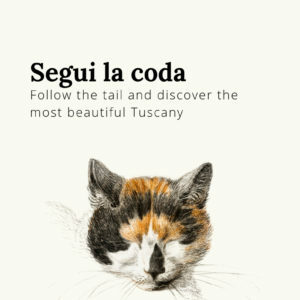 If you like to travel, find Italian travel bloggers and subscribe to their newsletter, read short articles from online travel magazines, use social networks to follow experts and world wanderers. Pick all the linguistic information that serves you and enjoy the rest! If your passion is knitting and crocheting do all of the above with people from your area of interest. One good way to start? Choose a simple pattern in Italian and make the scarf, blanket, amigurumi that’s described there; you could start here or here. If you are addicted to tv series, or tv in general you can find something interesting here or even here. Television is a good option if you are an intermediate/advanced student, but be careful with original shows if you are just starting out. 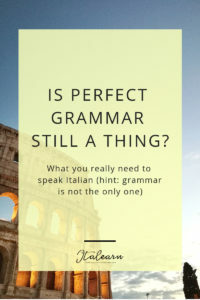 The Italian language has hundreds of idioms and fixed expressions that go beyond the literal meaning of the single words; there is also a wide variety of accents and dialects, so at first you may not recognize the sound of words as you have studied them. My recommendation is to be exposed to the language as much as possible, don’t limit yourself to the materials you are given in class. There are many resources online, mostly free, to help you break through the plateau by raising your standards and expanding to new areas. Getting the message through is the ultimate goal of every language learner, at whatever level. Good communication is more important than perfect grammar or pronunciation, it is the foundational block of human interactions. It is possible to communicate effectively even as beginners, don’t let your lack of vocabulary discourage you. Building elaborate speech structures is something even natives struggle with and, notably, it is not required. 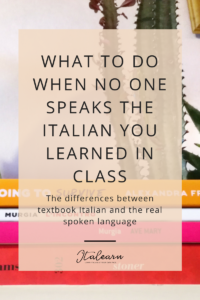 You won’t find an Italian native speaker who is not willing to help you learn their language (unless they want to practice their English, but that’s another story!). 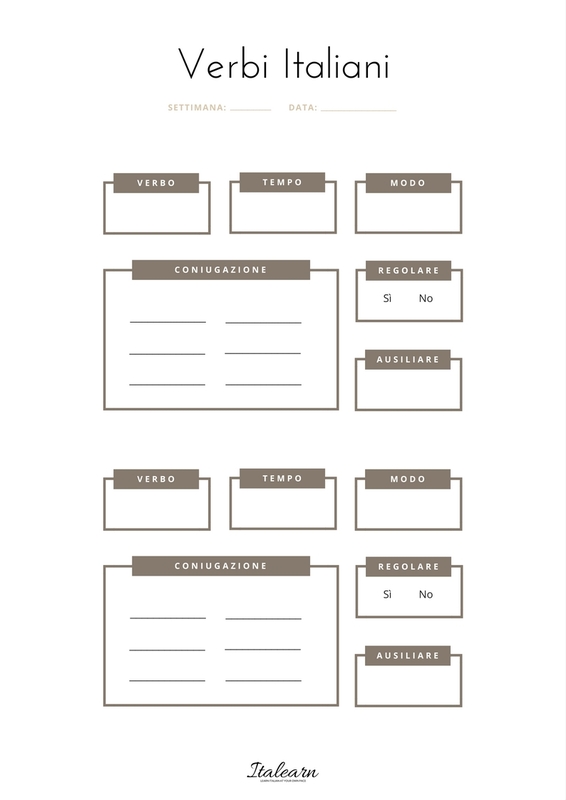 Speaking is important, that’s why my third strategy is all about communication. If you have put it aside until now, maybe because you are shy or because your conversation partner is not at your level or is no longer interesting (hitting the plateau again here), you really need to revitalize your skills and talk to new real people. Talking is intended as both writing and speaking, we’re interested in good communication in both areas. 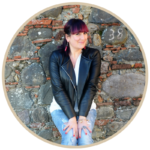 How can you bring new life to your conversations and make them brilliant, informative and useful, a real asset in your language learning practice? 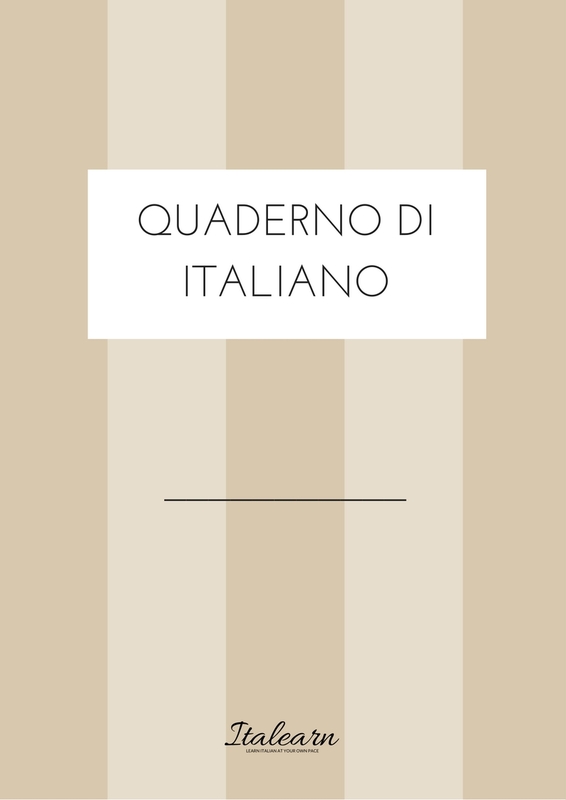 In strategy #2 we explored the possibility of following the social media of Italian people in your areas of interest as they are a source of new language. My strategy now is to interact with them: comment on their Instagram photos, ask questions when they are live streaming on Facebook, tweet back your opinion on something meaningful they have shared. 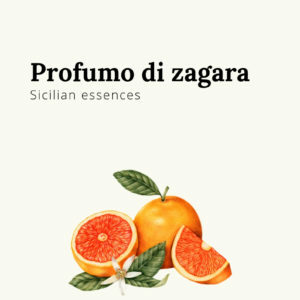 Is there someone from Italy in your community? Maybe a university student, or someone who works with your husband, or the mom of your kids friend. They are an opportunity to practice the language with native speakers. Find them and connect. 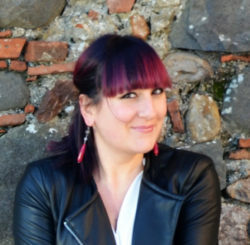 If there are no real chances of finding native speakers near you, then find them online and make your “conversation-date” once a week or as many times you think you need it. Acknowledging that you are stuck is the first step to get out of the slump. You then have to be 100% sure that you want to get out the slump, because maybe you are not interested in setting new goals and progress further, you may just be happy of what you already have. The feeling of reaching the plateau is indeed our occasion to step to the next level of our learning practice. I’m using a generic concept, next level, because it is not important whether you are a beginner or an advanced student, you will always have goals and something new to learn. 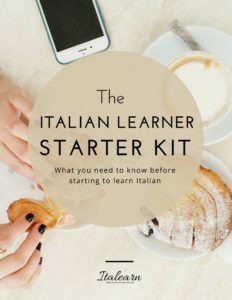 When starting out it is important for you to make yourself understandable, to build short sentences with basic vocabulary because you want to have at least a minimum interaction with natives when you’ll go to Italy. When you are and advanced speaker it is important for you to get every verb correctly and to have a list of synonyms ready to use because your next essay will get an A+. The plateau offers us the chance to grow, we should take it. Because setting a goal and reaching it is pure pleasure. 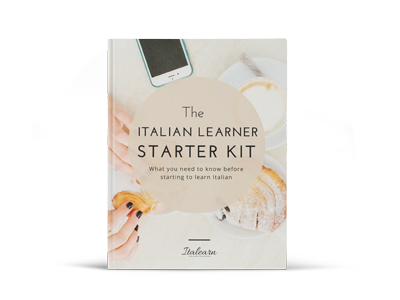 Start learning Italian on your own. Stress-free. At your own pace.